Will Ari Ne'eman, ASAN and the rest of Neurodiversity oppose Avonte's law? 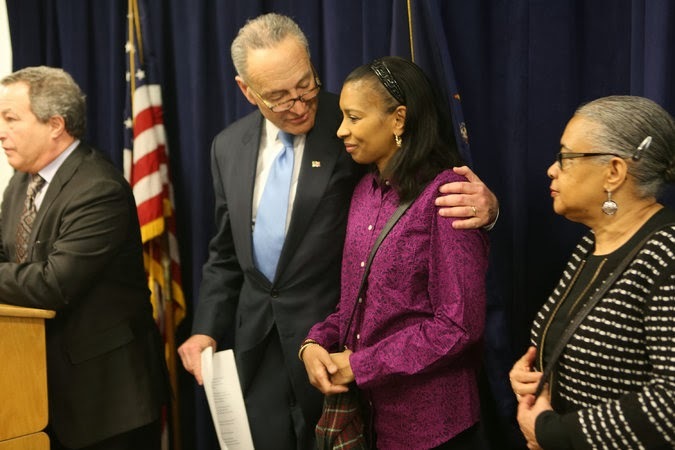 As most persons who peruse stories on the internet about autism know, Avonte Oquendo, a 14-year-old boy with severe autism recently perished after wandering away from his school. His remains were found after a three month search. Because of this, New York senator Charles Schumer has proposed legislation that will hopefully prevent this tragedy from happening ever again. In the past, the autistic self advocacy network, one of the main groups of individuals who serve as proponents for the neurodiversity movement has opposed diagnostic codes for wandering due to the fact that this will result in restraint and seclusion of developmentally disabled people. I noticed in Ari Ne'eman's google plus page, he's offered condolences for Avonte's untimely demise. He and the rest of ASAN have claimed that there are certain behavioral techniques that can help eliminate wandering, but has been rather vague about the specifics (par for the course for Neurodiversity). They were opposed to the wandering codes because they believed it was a violation of human rights. How about Avonte's right to be alive and other kids like him. There seems to be no shortage of autistic children who perish in accidental drownings, being run over by cars, etc. Certainly food for thought. An advance plug for Steve Silberman's neurodiversity book? As regular readers of Autism's Gadfly know, I've been waiting for publication of Wired writer Steve Silberman's book about neurodiversity for a long time. Originally, it was slated to be published in 2013. The date was subsequently moved up to 2014 and now the tentative date is 2015. Silberman published a magazine article on the subject way back in 2001. He's received a plug in this article It's nothing really new. Silberman is still citing the rapid rise of autism in the silicon valley and the assortive mating theory as a reason. I wonder if Silberman's book (assuming it's ever published at all) will cite statistics showing autism grew faster in the silicon valley than in other parts of the country or world. I've written previously that of the 21 regional centers in California, the rate of autism growth for the San Andreas RC (which serves the silicon valley) was 9th, falling far behind the rate of growth of the Lanterman and West Los Angeles regional centers. I wonder how Silberman will explain that growth rate. I've written about problems of the assortive mating theory and proponent's Simon Baron Cohen's lack of knowledge about genetics elsewhere. Silberman name drops the notable Zuckerberg, Gates and Tesla and it looks likely he'll try to prove those people had autism. Of course he does not go as far as Temple Grandin who has claimed that half of the silicon valley has autism but never bothered to get a diagnosis. He also goes on about harnessing autistic intelligence and how if we stopped researching genetics and ways to harness the strengths of autistic people they can live more independently. I'll look forward to reading about that hopefully sometime next year. I'm also a tad curious whether Silberman, a gay man married to another man, will make comparisons between homosexuality and autism that others with neurodiverse leanings have made in the past. As I've said before, I'll be interested in reading the book at some point and dissecting it point by point in a blog post. Hopefully the publication won't be postponed to 2016 when we hit the end of 2014 or beginning of 2015.